Since Contrexx version 2.2 SP6 you can activate the debugging output of Contrexx through the Development tools tab in the Global Configuration section (Administration > Global Configuration > Development tools). Activating the debugging output through the Development tools will activate the debugging on a per-session basis. Meaning that the debugging will only be active for the user who has activated it. All other users won't be affected by the debugging output. Therefore it is highly recommended to activate the debugging output of Contrexx always through the Development tools on a production system to prevent any other user from being affected by the debugging output. Note: Is is not recommended to use the manual activation on a productive system! 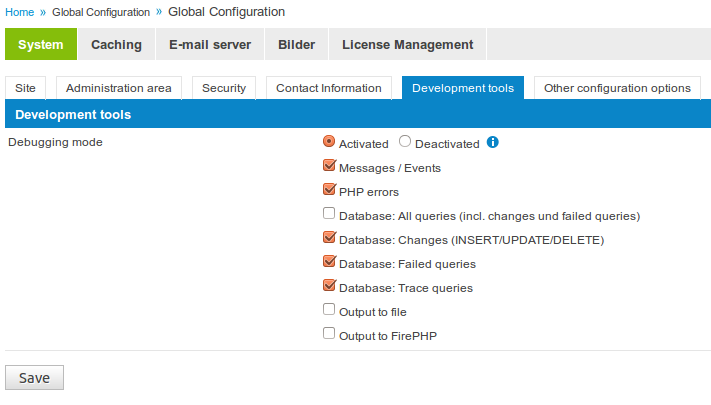 Instead use the Development tools in the Global Configuration section. Both methods activate() and deactivate() accept a bitwise combination of the available debug levels (see #Debug Levels). Therefore you can individually activate/deactivate each debug level throughout your code. DBG_ALL Note: This option is useless! The helpers DBG::activate() and DBG::deactivate() to control the debugging output are available since Contrexx version 2.1 SP3. See next subsections on how to activate the debugging in older versions prior to version 2.1 SP3. This page was last edited on 10 April 2018, at 01:50.